Prestige Paints 100% acrylic exterior latex paint and primer in one is a high end paint intended to be used on exterior surfaces including properly prepared wood, masonry surfaces, cement board siding, vinyl*, aluminum, and factory primed siding. (Note: when painting vinyl siding do not paint with any color darker than the original siding. Painting with darker colors may cause the siding to warp.) surface Preparation: remove dirt, mildew, grease, wax and soap residue, loose and peeling paint. Glossy areas must be dulled by sanding. PRIME all bare, new wood and factory primed wood with an oil base primer. PRIME masonry surfaces including cementitious siding with a latex primer. Application: Stir or mix paint before using and intermix all containers for color uniformity. Apply as is with a high quality brush, roller or pad painter. Thin sparingly with water if necessary for spraying. Do not overspread. Temperature must be above 50 F (10 c). average coverage 400 sq. Ft. (37 square meters) per gallon (3.78 L). for best performance, apply two coats of paint on new surfaces after priming. Do not use indoors. Dry time: Dries in 1 to 2 hours. Allow to dry overnight before coating. Low temperature or high humidity may increase dry time. Cleanup: use warm water and soap. Satin finish paints are probably the most commonly used finish on exterior surfaces. Satin finishes resist mildew effectively and are easier to clean than flat or eggshell finishes, and can be wiped down or scrubbed lightly. On exterior surfaces, satins are ideal for painting siding that is in good to excellent condition. Outside surfaces painted with satin paint also shed water effectively and don't fade quickly from the sun. They are also a good choice for painting trim and shutters. *Prestige paints uses proprietary base paints and tints to create and match colors. 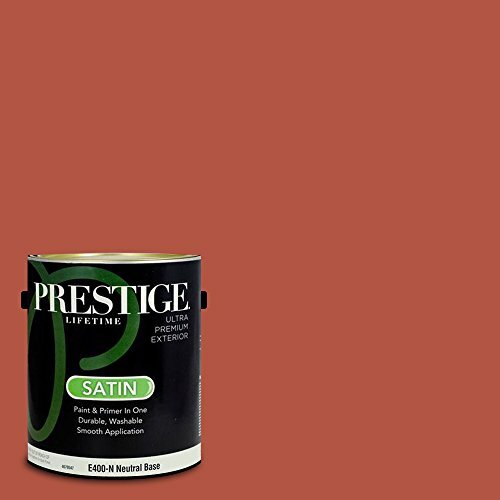 Prestige Paints works with industry leaders in paint color to match the color on this page based on the color specifications of the original to create a comparable color. Prestige Paints is not offering the ACTUAL branded color or paint product for sale and is not associated or affiliated with the color-referenced brand. Prestige Paints reference to any trademark is for color comparison only. Actual paint colors may vary from on-screen and printer representation. Note that color can vary due to sheen, light, surface, and application method. If you have any questions about this product by Prestige Paints, contact us by completing and submitting the form below. If you are looking for a specif part number, please include it with your message.